Where did all the antihadrons go? Describing the very ‘beginning’ of the Universe is a bit of a problem. Quite simply, none of our scientific theories are up to the task. We attempt to understand the evolution of space and time and all the mass and energy within it by applying Albert Einstein’s general theory of relativity. This theory works extraordinarily well. But when we’re dealing with objects that start to approach the infinitesimally small – elementary particles such as quarks and electrons – we need to reach for a completely different structure, called quantum theory. Now, the general theory of relativity can’t handle some things in ways that quantum theory can, and vice versa. But when we try to put these two venerable theories together to create some kind of unified theory that could do the work of both, we find that they really don’t get along and the whole structure falls apart. So far, nobody has been able to figure out how to fix this. It’s therefore no surprise that there are many mysteries surrounding the very beginning of the Universe, in a hot ‘big bang’. But we can be reasonably confident in what our scientific theories are telling us about the subsequent evolution of the Universe from about a trillionth of a second of its coming into existence. Now, I would respectfully suggest, that’s not so bad. At this moment in its history, the Universe was witness to a parting of the ways between the weak nuclear force, which acts on atomic nuclei and is responsible for some kinds of radioactivity, and the electromagnetic force. This event left us with a collection of elementary particles and forces pretty much as we know them today. Our current theories suggest that the Universe then evolved as it expanded and cooled through a series of ‘epochs’ in which different kinds of particles dominated. First up were the quarks, which quickly combined together after about a millionth of a second to form larger particles, such as protons, neutrons, and mesons (collectively called hadrons, which is Greek for ‘thick’ or ‘heavy’). Now, we’ve no reason to think that the quarks would not have combined to produce equal numbers of hadrons and antihadrons, particles with the same mass but opposite electrical charge – the same numbers of positively-charged protons and negatively-charged antiprotons, for example. And, as hadrons and antihadrons tend to annihilate to produce energetic gamma ray photons when they meet each other, we might anticipate that, after about a second or so, there are no hadrons left in the Universe. There must be something else going on. We’re witness to the simple fact that, as far as we can tell, the visible Universe – stars, galaxies, planets, rock, ocean, sky, life – consists of atomic nuclei containing protons and neutrons. So, what happened to all the antihadrons? We have no choice but to accept that, when all the hadron-antihadron annihilation reactions were done, what was left was a small residual number – about one particle per billion – of regular hadrons. This might be random chance. If there is some subtle physical mechanism which determines that hadrons could be expected to dominate, we do not yet know what this mechanism is. 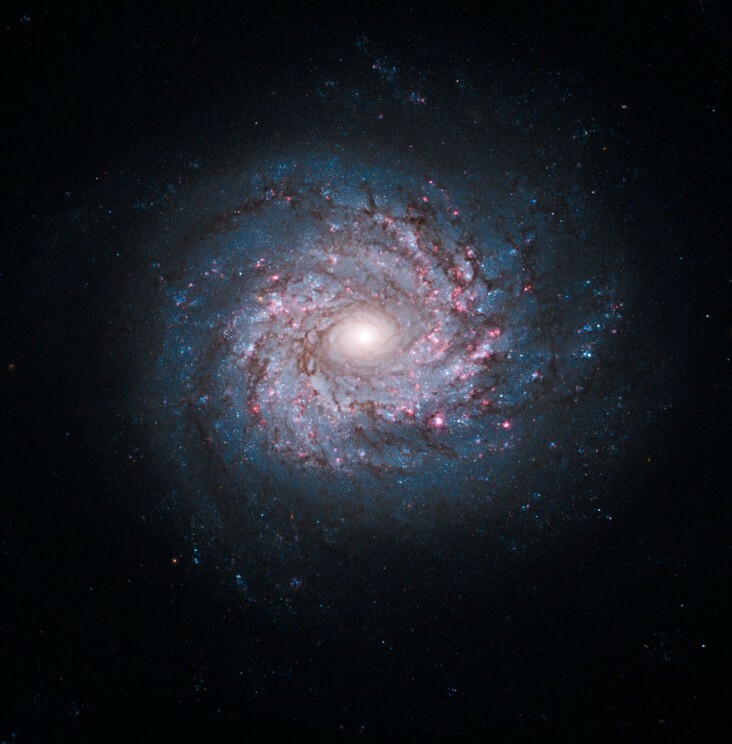 Spiral Galaxy NGC 3982 by Hubble Heritage. CC BY-SA 2.0 via Flickr. One possibility is that there are subtle differences in the strengths of the force between proton and proton and between antiproton and antiproton. Although one proton experiences electrostatic repulsion when pushed up close to another proton, the strong colour force binding the quarks inside each particle ‘leaks’ beyond its borders, so two protons actually experience a mutual attraction. This attractive force is essential as it serves to hold more complex nuclei – consisting of many protons and neutrons – together. If the force between antiproton and antiproton were for some reason weaker, this could explain the source of the hadron-antihadron asymmetry. In some very recent experiments by scientists working on the STAR detector at Brookhaven National Laboratory’s Relativistic Heavy Ion Collider in the US, the interactions between antiprotons have been measured for the first time. In these experiments heavy gold atoms are accelerated and smashed into each other, occasionally producing a pair of antiprotons in the ensuring chaos. The antiprotons ‘scatter’ off each other and are detected, providing measures of the strength of the interaction between them and the range over which it acts. The bottom line is that, within the accuracy of these measurements, there is no difference in strength and range in antiproton-antiproton interactions compared with proton-proton interactions. The strong force works just the same for antiprotons as it does for protons – it is not responsible for the hadron-antihadron asymmetry. 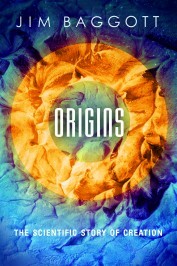 Jim Baggott is the author of Origins: The Scientific Story of Creation. He was a lecturer in chemistry at the University of Reading but left to pursue a business career, where he first worked with Shell International Petroleum Company and then as an independent business consultant and trainer. His many books include Farewell to Reality: How Fairy-tale Physics Betrays the Search for Scientific Truth (Constable, 2013), Higgs: The Invention and Discovery of the ‘God Particle’ (OUP, 2012), The Quantum Story: A History in 40 Moments (OUP, 2011), Atomic: The First War of Physics and the Secret History of the Atom Bomb (Icon, 2009) and A Beginner’s Guide to Reality (Penguin, 2005).